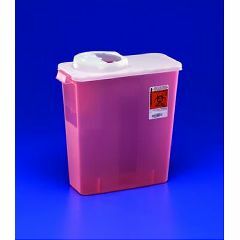 The DialySafety™ dialysis sharps disposal containers with rotor & hinged opening lid have adjustable rotor lid to easily accomodate small and large sharps, including fistula needles. Features: Designed for dialysis use to accommodate fistula needles. Rotor Lid adjusts to accommodate small and large sharps. Temporary Closure and Final Lock prevent accidental contact with container contents when not in use; secures for final disposal. Built-In Carrying Handles makes transport for final disposal safe and easy. Nestable Containers saves valuable storage space. 3-Gallon Capacity. Transparent Red.